The Four Communes of Senegal in French West Africa, Gorée, Dakar, Rufisque, and Saint-Louis, were the only places during the African Colonial period, where African inhabitants were granted the same rights as French Citizens. As early as 1840, the importance of Gorée Island and Saint-Louis (located on an island of the Senegal River) as key French trading post settlements led to the establishment of a General Council in each colony. In 1848, the Second French Republic awarded to its Senegalese colonies the right to send an elected representative to the French National Assembly. Later in 1872, a decree granted to Gorée and Saint Louis the same advantages as French Communes. Due to the intensification of trade activities in the city of Rufisque, situated on the Atlantic Coast, identical rights were granted to the settlement, which became a fully-empowered commune in 1880. Dakar, now the Senegalese capital, was the last settlement to be granted the rights in 1887. It became the fourth Commune of Senegal. The policy of assimilation was promoted vigorously in the Four Communes of Senegal. 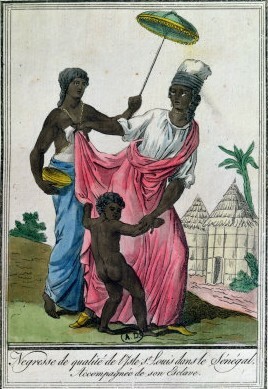 The African inhabitants of the Four Communes, called the Originaires, had the status of French citizens and thus were unlike other African inhabitants, who were subjects of the French empire and controlled by the Code de l’Indigénat or the Colonial penal code. If literate in French and familiar with French customs, the Originaires could work in administrative institutions and participate in the political and social life of the colony. However, African Originaires often faced limitations on their rights and career advancement. Although each Commune had an African majority, political representatives were often European colonists or Métis. In 1907, Galandou Diouf was the first African Originaire elected as Legislator Councilor in Rufisque. In 1914 Blaise Diagne, also an Originaire, became the first African to win a seat at the French National Assembly. Diagne subsequently became the most important politician in the four communes. He worked to gain full voting right for the Originaires in 1916. At Diagne’s death in 1934, Galandou Diouf succeeded him in the French Assembly. Lamine Gueye, the last Originaire politician in Senegal, replaced him during World War II. In 1946 Gueye gained voting rights for all African subjects in Senegal, equalizing their status with that of the Originaires. With the Independence of Senegal in 1960, the special rights awarded to the inhabitants of the Four Communes were permanently abolished.